In Connecticut, which has the shortest welfare time limit in the country, desperate families are selling food stamps for pennies on the dollar to cover basic necessities. Since she was 16, Eva Hernández has worked a string of low-wage jobs. She's prepared chicken at KFC, run the register at Dunkin Donuts, packed and sealed boxes at a produce company, and held other similar jobs in Hartford, Connecticut, where she was born and raised. These jobs haven't paid enough for Eva, now 28, to support herself and her two young daughters. So for almost three years in the last decade, she's relied on welfare to supplement her income. Most of the time, though, she's simply found another low-wage job, a task that in this economy is proving almost impossible. In March 2009, in the midst of the worst job crisis in at least a generation, Eva opened the last welfare check she will ever receive. She is one of a growing number of people in the United States who can't find work in this recession but don't qualify for government cash assistance, no matter how poor they are or how bad the economy gets. Without the help of welfare, Eva doesn't have enough money left at the end of each month to feed her daughters full meals. It is the first time in her life, she said, that she hasn't had enough money for food. Now, with no other source of income, Eva breaks the law, selling her food stamps to pay for the rent, phone bill, detergent and tampons. On the first day of each month, when her food stamps arrive, she walks to the convenience store up the street, buys food for her family with her food stamp card and uses it to pay off the debt she accumulated the previous month after she ran out of money. She then trades in the remaining balance for cash. Although the bodega is more expensive than larger chain grocery stores nearby, she's locked into shopping here because places like Wal-Mart won't let her keep a tab — or exchange her food stamps for desperately needed cash. About 6 million people receiving food stamps report they have no other income, according to an analysis of government data collected by The New York Times. Nine other women interviewed across Hartford said that they, too, have had to trade their food stamps to make up for the lack of work or income assistance. Service providers in Hartford, including the director of a food assistance organization and a case manager at a social service organization, confirmed the practice. When Congress overhauled welfare in 1996, it created the Temporary Aid to Needy Families (TANF) program that placed time limits on aid and made cash assistance contingent on finding a job. Connecticut adopted the shortest time limit in the country — just 21 months — and nationwide the number of families on TANF dropped from 4.8 million before welfare overhaul to about 1.7 million families in 2008. Most people who left the rolls were pushed into insecure and low-wage work. At the time in 1996, there was no national debate about what would happen to families if an economic crisis struck. Now, with a national recession that many analysts recognize as a depression in poor communities of color, even those low-wage jobs are few and far between, and the crisis that's hit middle-class Americans hard has left families like Eva's teetering one small step away from a tumble to homelessness and despair. What follows is Eva's story. It's a life in the economic recession without work or income assistance. Her name and those of her family members have been changed because of fears that they would lose their food stamp assistance if known. This is an account of a typical month in her life, pieced together based on multiple visits with her and her family over a three-month period this winter. The air was cold and damp on a gray January afternoon. It had rained a lot this winter, and the sidewalk was covered in wet, decaying leaves from the fall, the curb lined with pieces of trash, a broken Hennessy bottle, a discarded sock. Eva, a short Puerto Rican woman with round, tired eyes, walked with her 5-year-old daughter, Emily, the quarter mile from the elementary school to their apartment. Emily skipped a couple paces ahead of her and then turned around to wait for her mother. Dressed in a New York Yankees jacket and a matching winter hat, Eva took Emily's hand and gestured across the street with her chin to a small convenience store in the corner of a yellow–paneled, two-story house. “That's my store. They help me out,” she said. It's here that Eva performs her monthly ritual: buying food and then trading her remaining food stamps. The store itself is a tight room and a gathering spot. During one trip, two men, their faces creased with the deep lines of their age, were tilting their necks to watch the Mexicantelenovelas playing on the dusty television screen perched above a soda case. A teenage boy was peering into the soda case, while behind a candy-lined sheet of plexiglass, a woman in her late 20s sat at the register and painted her fingernails red. On the first of the month, Eva walks around the corner and through these doors. She has $526 in food stamps, now called SNAP (Supplementary Nutrition Assistance Program), which she receives in the form of monthly deposits on her EBT debit card. At the store, Eva first pays off her debt, which she racks up each month once her money is gone and she still needs a few cans of food or bottles of milk. The attendant logs the purchase in a ruled notebook to be tallied at the start of the next month. Some months Eva owes close to $100 when she arrives with a newly filled food stamp card. She's been lodged in this cycle since she lost cash assistance almost a year ago, and now she relies on the store to let her keep living in the red. After settling her tab, Eva starts shopping. She gathers stacks of canned soups and beans, rice, milk and a couple cartons of eggs, which she supplements with fruit and vegetables, frozen chicken and sometimes pork from another, larger store near by. Her daughter Emily loves carrots, so she buys lots of those, and her 12-year-old, Janisa, asks for frenchfries, so she buys the frozen kind — cheaper than the ones from McDonalds. Eva piles paper towels and soap, detergent, tampons and aspirin onto the counter. She has to buy lotion for Emily's face, which Eva says gets so dry it starts to hurt the girl. When she's gathered all these items, she hands the clerk her food stamp card. The attendant rings her up for the food, swiping the full amount into the machine. Then she charges Eva separately for toiletries and other non-food items. For these, the store charges Eva a dollar on her card for every 70 cents she buys. The store profits on the exchange with Eva, getting the whole amount reimbursed from the state. Last year, a convenience store owner in New Britain, Connecticut was sentenced to four months in jail and fined close to $60,000 for this kind of food stamp fraud. After she buys the food and toiletries, Eva exchanges whatever remains on her card for cash. Usually that's about $150 or $200, but at a rate of 70 cents on the dollar she's left with around $105 to $140 in cash for the month. Although her mother receives $674 in monthly Social Security payments, Eva said all of that goes to rent, bills and her mother's costly medicines. Her mother has subsisted on the nutritional drink Ensure since cancer attacked the sick woman's stomach, making it hard for her to eat solid food. Ensure can cost as much as a few hundred dollars a month. Oftentimes, it is Eva who helps her mother pay down the light, gas and phone bills (the phone was cut off for two months last year) and the $100 a month in rent for their Section 8 subsidized apartment. This month, after saving for a while, Eva was finally able to buy Emily a new pair of sneakers. Her daughter's toes were pushing out of the ends of the last pair, which she'd had for more than a year. Numerous service providers in Hartford — including the director of a food assistance organization, two community organizers and a case manager at a social service organization in Hartford — confirmed that many parents sell food stamps as a regular part of surviving without work or cash assistance. None of them would speak on the record out of fear that exposing the practice could lead to a crackdown on one the few remaining means poor women have to get assistance from the state in caring for their children. According to the U.S. Department of Agriculture, the number of Americans receiving food assistance reached 38 million last year — the highest number since the program began in 1962. 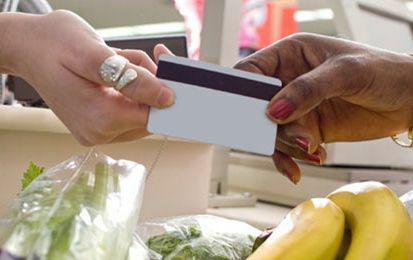 As of late November 2009, one in eight Americans and one in four children are using food stamps, and the program rate is growing at 20,000 people a day. In Hartford, half of those receiving food stamps are Latinos and a third are Black. For many families like Eva's, the descent into economic despair has been coming since before this recession. Connecticut's TANF program has gone from serving about 55,000 families in 1996 with cash assistance to about 18,000 families at the start of 2008, months before the financial crisis hit Wall Street. The impact of the overhaul of welfare, and specifically the time limits, has disproportionately affected women of color like Eva. Blacks, Latinas and Asians nationwide are about two times more likely than whites to have been pushed off cash assistance as a result of time limits, rather than for another reason, according to a ColorLines analysis of 2008 data from the US Department of Health and Human Services. Because women-led families make up 90 percent of TANF cases that have been closed, women of color like Eva are now more likely to be living without access to any cash assistance. For many people then, food stamps are all they have. The surge in food stamps has impacted local economic landscapes, as some businesses are now thriving off the increased participation in program. Owners and employees in four Hartford convenience stores said that business has actually increased as more people use food stamp cards. “There's a lot more cash on the streets now. More people have food stamps, and we're doing better now than before,” said the attendant at the bodega where Eva shops. The attendant had worked there for more than two years. In addition to the rising numbers of people using food stamps, many of them are buying more of their family's groceries at small local bodegas rather than going to less costly larger grocery stores that can be both hard to get to from poor communities and harder to deal with when using food stamps. “More people are buying everything for their families here,” the attendant said, adding that she estimated half of the customers who buy food at the store use food stamps. A few blocks away, at a recently reopened convenience store, the new owner said that he was suffering because the state had not yet supplied him with the machine needed to accept food stamp cards. “People are starting to go to other stores,” he said. He estimated that business was down by at least a third without the ability to accept food stamps. Smiling slightly, she asked: “Is there anything else I can do for you?” and continued painting her nails. Under the dimming sky, bundled in a winter jacket and a cotton hat, Eva trailed after her 5-year-old daughter and into her ground-level apartment in a three-story brick house on the South end of Hartford. Around the corner, two houses stood empty, their windows framed by char from fires. Since dropping her daughter at school that morning, Eva had walked the streets, sifting the city for work. She'd made a couple more stops after picking up the girl at the end of the long day. Now, Emily scampered ahead of Eva into the kitchen, squirmed out of her jacket, tossed it onto a metal chair at the kitchen table and disappeared into her bedroom to find her 12-year-old sister, who'd been home from school for almost two hours. Eva hung her jacket on the arm of one of the three haggard and mismatched couches in the living room. The heavy, yellow rug under her feet was stained from years of use and held down by pieces of duct tape on the corners. On the far wall, a desultory paint-by-numbers mural of the Greek acropolis was half painted. It had been started over a decade ago by the landlord and never finished. On the other wall hung paintings of Jesus and old sepia portraits of Eva's grandmother, among others, shot decades ago in Puerto Rico. Eva sat down at the table as Elsa placed a cup of coffee rich with cream and five spoons of sugar on the table for Carmen and then served a plate of cookies. Such treats are only offered for the first part of the month when the family still has some income. “They sell on the street,” the 12-year-old piped in. The women looked at each other and laughed uncomfortably. Eva hoped she would find a job this month before her debt at the convenience store started to pile up again and before the eggs and meat ran out. On this particular night, there was still chicken in the freezer, and the carrots she'd bought the week before were still good. A manager at an Au Bon Pain in the mall where she worked years earlier had told Eva that he'd call her if there were any openings. She didn't expect a call. People like Eva are not getting many callbacks at all these days. New York Times columnist Bob Herbert recently brought national attention to a report by the Center for Labor Market Studies at Northeastern University in Boston showing that at the end of 2009, households earning less than $12,500 a year faced catastrophic unemployment rates—almost 31 percent. In stark contrast, households with incomes of $150,000 or more faced an unemployment rate of just 3.2 percent. Eva and her mother do not talk much about what would happen if Elsa did not survive the cancer, but the unspoken sits thickly between them. If Elsa dies, Eva will be left with close to nothing: her mother's contribution to bills and rent would evaporate if her $674 monthly Social Security check stopped coming. It's also her mother's name on the Section 8 housing voucher. Unless Eva can get her name on the voucher in time, homelessness is the next stop for her and her daughters. Rent at market rate would be about $900; they now pay $100. Jane McNichol, executive director of the Legal Assistance Resource Center of Connecticut, said that getting Section 8 is “sort of like winning the lottery,” with waiting lists often five to seven years long simply to become eligible. Eva has never had a lot, but times were not always this hard. Her family is like many in Hartford. In the years around World War II, Puerto Ricans and Southern Blacks migrated to Hartford and other New England cities to work in the bustling manufacturing sector or in the nearby tobacco fields. Her father, who died a decade ago, worked in highway construction and then in unionized jobs in Hartford's factories. Her mother was 13 when she left the rural southern coast of Puerto Rico and came to Hartford in the mid-60s to labor in the tobacco fields and the long wooden barns where workers sewed the leaves together and dried them to be shipped off and used to wrap cigars. In the decades that followed, the manufacturing jobs left; the people stayed. The old brick structures scattered around the city are now abandoned or used as office buildings. Hartford is now majority people of color — more than 40 percent are Latino, mostly Puerto Rican, and close to 30 percent are Black. It is also one of the country's poorest municipalities, nestled in the middle of the second-wealthiest state. Eva herself has worked half a dozen jobs for almost a decade now, mostly in the food service industry. She began with a part-time summer job at KFC while she was in high school. But having never learned to read because of a learning disability, she dropped out of tenth grade, after her older daughter was born. A new mom, she realized she couldn't make ends meet with her low wages, and in 1999 she applied for cash assistance. She said the state's welfare-to-work program, Jobs First, pushed her into classes that taught her how to dress for a job, though figuring out what to wear to work, she said, was not her problem. No boss had ever told her to change what she had on. Eva knew people, and she got a job at a movie theater. What she really wanted though — then and now — was her GED. But welfare-to-work programs have ignored the need for access to education. When Congress reauthorized the cash assistance program in 2005, for example, four-year college education was deemed outside of the realm of appropriate and sanctioned job training. With her mother's Section 8 voucher and a less punishing economy before 2008, Eva struggled to keep her family afloat with low-wage jobs. For two years, she packed and sealed boxes at a wholesale produce company close to her house. The wages were low — just $8.50 an hour — and she worked grueling hours. “I started at five in the morning, and you could leave at like three or do overtime.” But the job allowed her to scrape by, since she could stay with her mother and didn't have to pay market-rate rent. The job also worked for her, she said, because it didn't require her to read. After two years at the wholesale company, Eva woke up one morning to find that her younger daughter had a high fever and her asthma had flared up. Eva called into work and rushed to the hospital early that morning “just to make sure she was okay.” When she got to the job in the afternoon after dropping the girl at home with her mother, tired from a long day in the emergency room, Eva found that she was being fired. According to Human Impact Partners, a national policy organization that advocates for paid sick days laws, low-income workers are less likely than other employees to get paid family sick leave, with 70 percent not getting paid sick leave even for themselves. The Connecticut state legislature has now twice voted down a paid sick leave bill. Eva's last job in 2008 was at a small Dunkin Donuts in a strip mall in West Hartford. Most of the workers there are young Latinos and Blacks who travel from far away to get there. It took Eva more than an hour to get to work, taking one bus into downtown Hartford and then another one back out to the mall. Already tired when she arrived, she'd spend the day behind the register and then scrubbing the floors, cleaning the toilets, taking out the trash. By the end of her shifts, her back hurt from leaning over and lifting. Sometimes, she'd be scheduled for shifts early in the morning or late at night. Because of the long commute and the sporadic bus service, she said she got yelled at almost daily for being late or having to rush out the door to catch the bus home. “If you missed the bus, you'd have to walk about five miles.” After four months, tired of getting yelled at every day and of the sore back, she quit. The move left her ineligible to collect unemployment benefits. Not long after, Eva's mother was diagnosed with stomach cancer. Eva wanted to help her mother through the chemotherapy, to take her to and from her appointments, so she applied for two six-month extensions of cash assistance. This gave her another year of help. But last March, the extended assistance came to an end. Although she's in the same situation, her caseworker has told her she would not be granted any more assistance. She's reached the end of welfare. Eva's been looking for a job since then. She knows that having her daughter in tow when she shows up to ask for applications hurts her chances of getting hired. She watches the judging eye of employers when she arrives at a workplace with the girl, but, with her mother's health declining, she has nowhere to leave her daughter. According to Carmen Cordero, who accompanied Eva to the appointment, the caseworker told Eva: “Everybody's moms die eventually” and “having your mom sick with those problems is not a reason for an extension.” Very few people are granted more than two extensions, and Eva has now given up trying. She hates going to the DSS office. “They look at us like we are stupid, like we are dumb, like we are lazy, like we don't want to do nothing for our living,” she said. And she hates the questions they ask about her children's father, who Eva wants nothing to do with, and about why she hasn't found a job. In January, the office was filled mostly with women like Eva — about 100 of them — trying to get benefits turned on, turned back on, figure out why they've been cut off. Parents, mostly Latina and Black women, some with children, sat in chairs set up in long school-classroom-style rows. Some men were there too, applying for food stamps and Medicaid for their families. In Hartford, 55 percent of those receiving TANF are Latino and 33 percent are Black. Every few minutes, a middle-aged woman opened a door to a back room filled with rows of cubicles and in a voice that sounded almost digital, called the next name in queue. Those waiting to set up an appointment lined up to talk to workers stationed at booths behind a sheet of thick glass. One large, middle-aged woman with a cane sat in a chair she'd pulled into the line. When the line moved forward, she lifted herself up with her cane and moved the chair ahead. A younger woman with a baby stood behind her. She had recently moved to Hartford from New York, hoping life here would be easier. The woman in the chair laughed and shook her head. In the first row of chairs, a short, round-faced Black woman who called herself Angelika and said she was 41 years old waited for her appointment. She had long ago timed out of cash assistance and had gone through periods of homelessness with her kids. When asked what she did to survive and support her children, Angelika lit up as if she'd been waiting to be asked. She'd been trading her food stamps for years, she said. “If I need toilet paper, pads, Tylenol, we sell food stamps. Everybody does.” As she told her story, a woman next to her piped in to say she'd done the same. Nine women who'd already timed out of the cash assistance program were interviewed in the Social Services office and in the living rooms of community organizers. They all had to use food stamps in illegal ways to get by. The practice is one of the few remaining ways these women have to get cash. For Eva, though, trading food stamps is new, something she wishes she didn't have to do and did not do until she found herself without any income at all. At Eva's house, the day was coming to an end. Both of her daughters were home from school, though the 12-year-old had come home late and went straight to her room. On the walk home from school, as they had passed Eva's bodega, her younger daughter looked at her mother and asked her for a bag of chips. “No baby. Not today,” Eva responded. “But I want some,” the girl protested. Eva did not have any spare cash left. When they got home, the girl said she was hungry, and Eva asked her if she wanted soup. The girl said she didn't. “What do you want?” Eva asked. “I want cereal,” her daughter said. Her daughter smiled, and Eva gave her a kiss on the cheek. Before heating a can of soup, Eva sent Emily to her room to change. She couldn't afford for her daughter to stain her school clothes while eating since she'd run out of detergent for the month. She is embarrassed that her kids sometimes appear ragged and dirty, and they said they look different than the other kids in the school. Last month, when she had to take her older daughter to the hospital, she worried that the doctors would think she was a bad parent because Janisa's shoes were old and worn. When she had picked up Emily from school earlier, Eva had looked into a room near the elementary school's front door. Inside, a couple of parents were picking through large garbage bags filled with clothes. It's a clothing drive the school started. For the same reason, worried about losing kids to foster care, Eva hates going to the food bank near her house to get food, even as the administrators say they've never seen this many people come through their doors, including many who've never needed help before. At the end of January, Eva woke up before seven and rushed Janisa out the door to school. She woke Emily and fed her a hot dog from the freezer for breakfast. She tried to put cream on Emily's face, pressing the tube's opening hard against her hand to get the last of the cream out. Emily turned her face in protest, but Eva told her it would make her look special, and she rubbed the cream on her daughter's cheeks. She helped her mother dress, handing Elsa a light brown wig that she wears when she leaves the house. Elsa walked slowly, resting against a wall as Eva guided her out the door. A man picking bottles out of their trashcan on the street looked up at them and then started looking through the bin again. In the emergency room, as doctors and nurses rushed past, Eva and her mother waited for two hours, surrounded by half a dozen other families. Elsa sat in a wheel chair between rows of plastic upholstered chairs, her head leaning back, unsupported by her neck and coming in and out of coherence. Trying to turn her head to Eva, Elsa asked where her granddaughter was. “She's at school, mommy,” said Eva. Elsa turned her head back around. “She's not right in the head right now,” Eva sighed. Eva's sister arrived at the hospital, and when their mother was admitted Eva left to pick up Emily. This wasn't the first time she'd had to leave her mother in the hospital. As she stepped out from under the ambulance overhang, rain fell lightly on her head. She looked up. “I don't need this. I don't need this life,” she said and walked home, carrying a plastic bag of her mother's dirty clothes. This week, there were no cookies or sugary coffee to serve a visitor. The refrigerator was mostly emptied, and Eva still hadn't found work. Twice Eva has walked early in the morning to a temporary work center near her house. Once, a few months ago, she was given a four-hour shift loading carpets into a truck. She was the only woman on the crew. By the end of the day, her back hurt, and she had trouble moving. At 4:30 a.m. on a bitter cold morning the same week her mother went to the hospital, three men sat half asleep, heads resting on their knees, outside the center. Hoping to beat the crowds, they had been there since 3:30 a.m. When the doors opened at 5:30, about 25 men and two women were gathered at the barren building, smoking cigarettes outside the front door or waiting in plastic chairs inside. Some would wait all day and go home without work, like Eva had. Sitting on her couch waiting for Janisa to come home from school, Eva lamented: “If you want money, you have to do a man's job.” And yet she doesn't come here for work anymore; the work is too hard on the body, she said. Eva smiled. “Well, that's where you're supposed to be, baby.” Emily giggled and started telling her mother about her day, about the book she read in the library and about a boy in her class. A week later, her mother was released and back home, still weak but no longer vomiting blood. They're waiting for word from the doctor, to hear if Elsa's cancer is back. It's the end of the month, so Eva picks up some cans of food from the store and puts them on her tab. Sometimes, her older brothers bring by a little food. But there's almost nothing left now. There are still a few days left in the month, and her tab at the convenience store is already $90. She'll pay that next week.